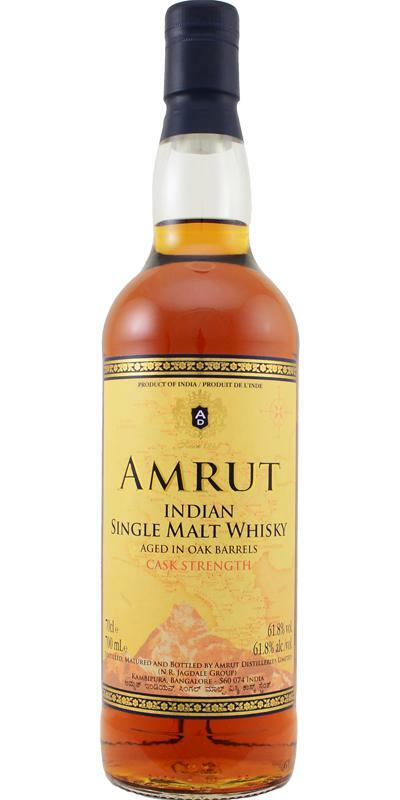 Amrut Distilleries, Indian Single Malt Whisky, Aged in Oak Barrels, Cask Strength, Bottled 12.2015, Batch No. 70, 61.8 % Vol.On back label:B.No.70DEC-2015On small label over the stopper:HNR 07/14 IML-700ml0000628970 / 480Furthermore: ncf & nc.I liked it very much.I give it 87 to 89 for sheer drinking pleasure, but according to the standard whisky rating scales I should give it a 85 to 86, since it is not very complex or with a great length, but it is clean and very well made with a nice malt taste and lots of barrel tones and tannins, which I like. 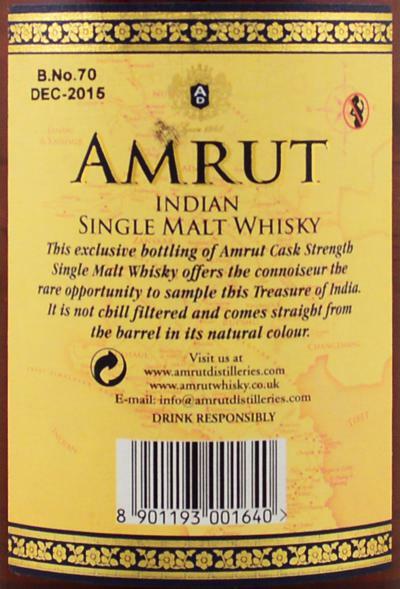 And I like it's somewhat rough and rustic style, so not very well balanced according to the high whisky standards.Very drinkable, also at approx. 50 to 55%Abv.For approx. € 52 a nice buy and then QPR=8 (but I paid only € 47.50, than QPR=8.5).I have finished this bottle now, and I have to buy another one.